This component uses the Bing Search API to retrieve search data and load it into a table. This stages the data, so the table is reloaded each time. You may then use transformations to enrich and manage the data in permanent tables. 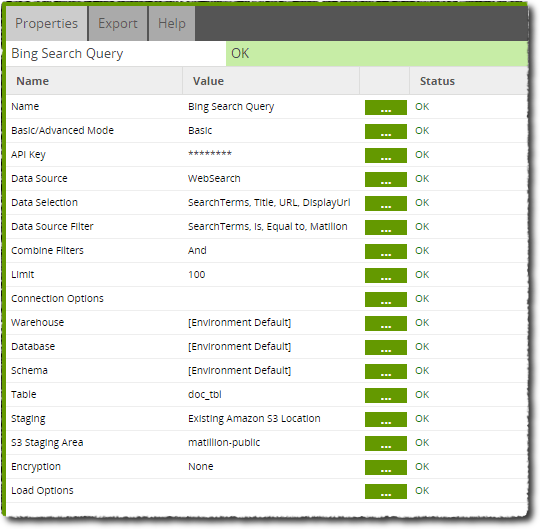 The component offers both a Basic and Advanced mode (see below) for generating the Bing Search API query. Note that although this is exposed in an SQL-like language, the exact semantics can be surprising - for example filtering on a column can return more data than not filtering on it, an impossible scenario with regular SQL. 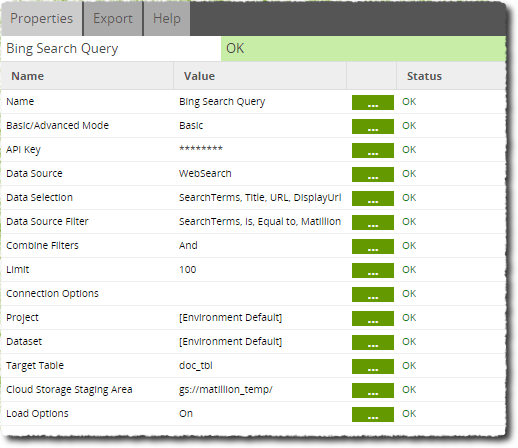 Basic/Advanced Mode Choice Basic - This mode will build a Bing Search Query for you using settings from Data Source, Data Selection and Data Source Filter parameters. In most cases, this will be sufficient. Advanced - This mode will require you to write an SQL-like query which is translated into one or more Bing Search API calls. The available fields and their descriptions are documented in the data model. API Key Choice Enter the Bing Search API Key available from your Microsoft Azure account (when subscribed to Bing Search). Data Source Choice Select a data source. The data source is the type of Bing Search you'd like to attempt - a generic Search, Image Search, Video Search, Web Search or News Search. Data Source Filter Input Column Filter your search results. Important: You must include a 'SearchTerms' filter. This is the phrase you are performing a search for. Failing to do so will produce an error. SQL Query Text This is an SQL-like query, written according to the Bing Search data model. Limit Number Limit the number of results returned. It is worth noting that a Bing Search can potentially give millions of results, each being a unique row when loaded into a table. As such, we set a default limit to avoid accidentally loading large volumes of data. Value A value for the given Parameter. 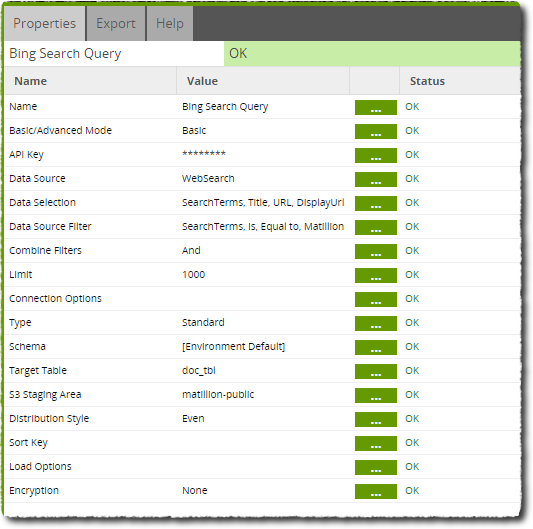 The parameters and allowed values for the Bing Search provider are explained here. Connect to the target database and issue the query. Stream the results into objects on the target platform. Then create or truncate the target table and issue a COPY command to load the objects into the table. Finally, clean up the temporary objects. In this example we want to gather data about how Bing Search sees our company website. We could then use the data to better understand if our company is confused for other things by the search engine. Or we could query this weekly and compare against previous data to see if new mentions of the company have appeared and which sites they are from. To load the data, we decide to use the Bing Search Query component to load search results into a table. The job is shown below, linking to a Transformation job that will work on the loaded data. The Bing Search Query component is set up as below. We've retrieved the Bing Search API key from our Microsoft Azure account and entered it into the API Key property which in turn allows us to select the WebSearch Data Source to specifically target websites (as opposed to images or videos). We need to set up a search term by using the Data Filter property. In this example we'll search for 'Matillion'. Now the component can be run. It will take some time to perform the query and load data into a table. Once completed, the data can be sampled using a Table Input component from a Transformation job.